Volunteering in Ghana has been a big industry for a long time now. But when people think of volunteers in Ghana they often think of people flying from all over the world to work on a number of projects (some good and some not so good). However, over the last couple of years we’ve seen an increase in the recognition and promotion of Ghanaians volunteering. This is a positive development and something that deserves to be highlighted. Whilst I strongly believe in the impact that overseas volunteers can make in a communities, to see real and sustainable change the members of that community itself must be leading on projects. Volunteering, which leads to higher civic engagement and social capital, is one the most powerful tools available when trying to create change in society. A report published by the UN this summer called on governments of all countries to “harness the power of volunteers” and “go beyond the rhetoric of participation” to ensure that all voices of society can be heard. In Ghana this summer I was particularly pleased with two developments in relation to volunteerism in Ghana. 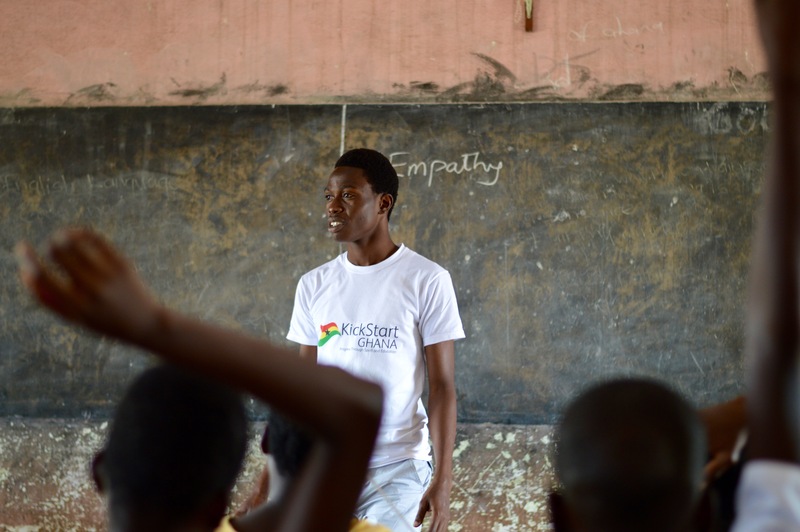 Firstly, the recruitment of three new directors for the Ghanaian board of KickStart Ghana and their decision to volunteer full time at the St Cecilia Summer School. 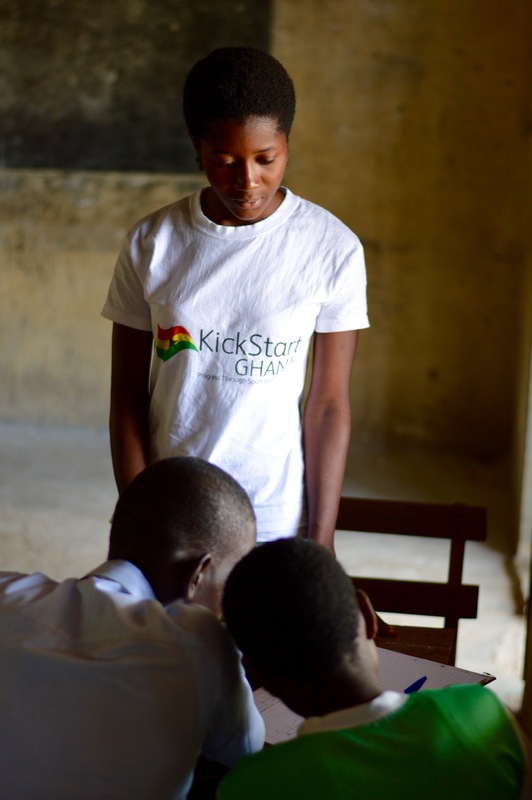 Daniel and Coco have put in huge amounts of work over the past few years to get KickStart Ghana where it is today. However, to take the charity on to the next level it needs more people involved, offering different skills, in a committed manner. I’m confident that Prince, Rachael and Divine will do a wonderful job taking on that responsibility, making an impact in their community and being fantastic role models for the young people of Ho. I look forward to working with them very much. Having known Prince and Divine since they were teenagers I was very proud to see them leading on extra-curricular lessons at the St Cecilia Summer School. Watching them build the students’ confidence in creativity, public speaking, teamwork and many other soft skills was particularly satisfying. 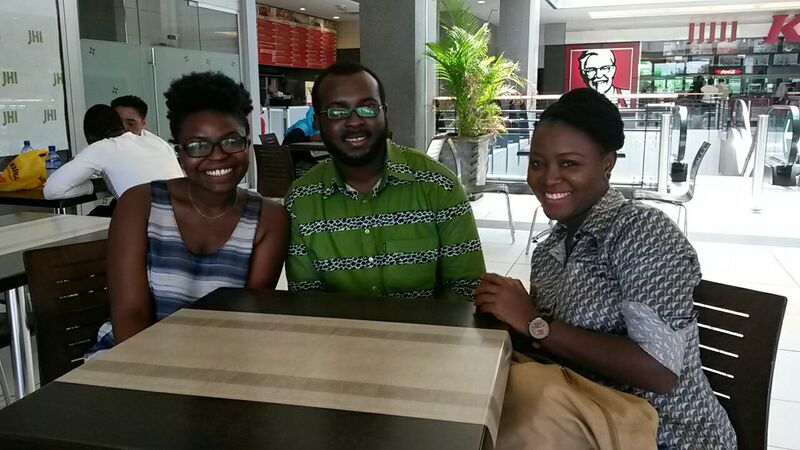 Rachelle did an excellent job too and so did Edem in his first volunteering experience with KickStart Ghana. 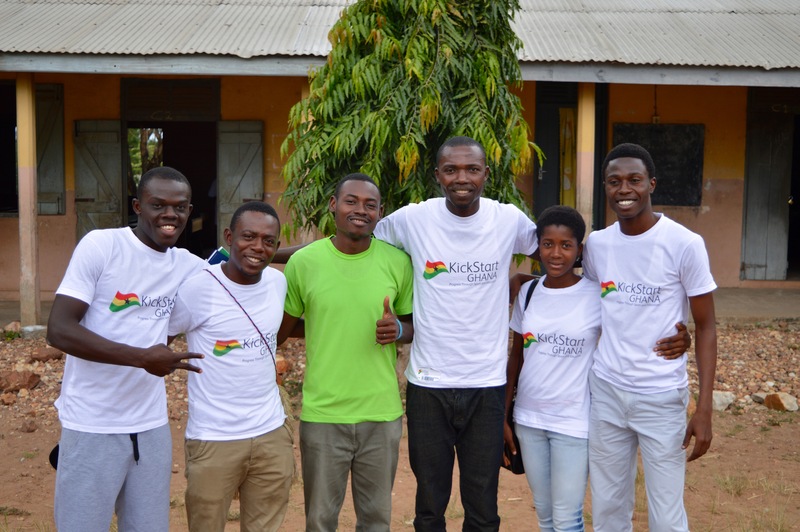 KickStart Ghana volunteers, from left to right: Prince, Coco, Edem, Daniel, Rachelle and Divine. The second development is on a much broader scale. For the past two years I have seen a lot of talk on Twitter around Founder’s Day, 21st September, about turning this in to a national volunteering day in Ghana. 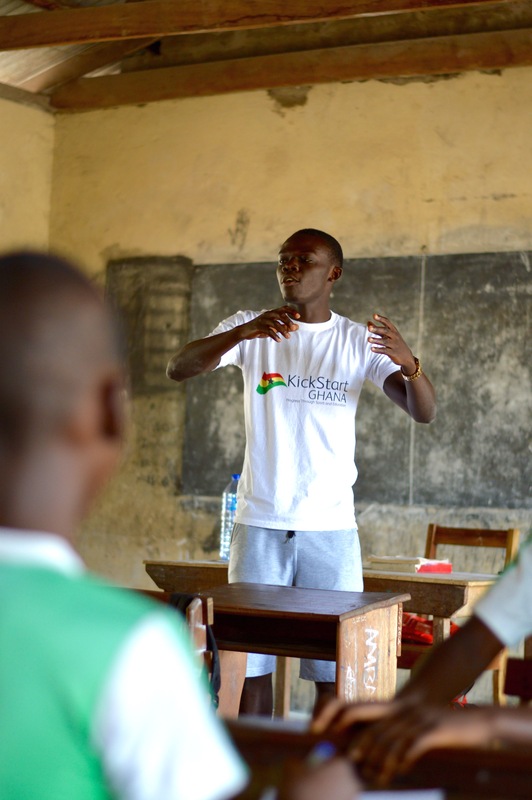 Started by a think tank called Ghana Think, it seems to be getting bigger and bigger each year and it’s been brilliant to see volunteering in Ghana being led by Ghanaians. As I was in the country approaching the date this year I thought it would be good to reach out to the organisers. I was lucky enough to meet three of the volunteers that are heavily involved in the project, Adelina Martey, Gerald Sowah and Eleanor Asare. This small team blew me away from the moment I met them. Their dedication to volunteerism in Ghana is huge, matched by their understanding of the issues that face their endeavor. They’ve put in a massive effort to make the Ghana National Volunteer Day such a success; with over a hundred projects this year and many success stories (check out #NVDay15 and this blog for a small taste). Their ambitions are way beyond one day a year though and they currently have plans to build a database of voluntary opportunities across Ghana for Ghanaians to get involved in. I’ve no doubt they’ll succeed but if you’d like to help then consider contributing to their cause. The Ghana National Volunteering Day Team. From left to right: Adelina, Gerald and Eleanor. I believe that volunteerism is on the rise in Ghana from projects such as KickStart Ghana and national initiatives that are broadening the conversation about how Ghanaians can contribute to their community. This is incredibly important in any society and I believe NGOs, corporations, local and national government should be investing in good volunteer recruitment and management practice in Ghana, creating opportunities for mass participation. I look forward to hearing more success stories on this theme. The spirit of volunteerism is indeed great.Volunteers never get paid and it’s all because they are simply priceless.know your worth as a volunteer.I love volunteering and am a member of the rotaract club.Spirit of service it is!! Thank you for your comment and it sounds like you volunteer a lot! Keep up the good work!